As attendance at Disney World keeps growing, Disney has been offering more opportunities for guests to enjoy the parks outside of normal operating hours. One of these newer events is Disney After Hours, which is an opportunity to enjoy a park with very little to no wait times, along with some other special perks. We recently enjoyed the first Disney After Hours at Hollywood Studios. Catch our full review below. In April of 2016, Disney After Hours debuted at Magic Kingdom as a separate hard ticket event. Now, the event has expanded to Disney’s Animal Kingdom and Disney’s Hollywood Studios. The event, which does not replace or impact Extra Magic Hours, and does not affect regular operating hours, is offered on select nights after regular operating hours throughout the year. Paying extra to have access to attractions with little to no crowds, guests can enjoy the parks in a whole new way! Admission to the event is $125 in advance or $129 the day of the event. 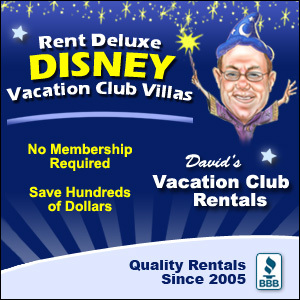 DVC members and Disney Annual Passholders can purchase tickets for $95. These prices are in line with other special event tickets such as Mickey’s Not So Scary Halloween Party in October and Mickey’s Very Merry Christmas Party. 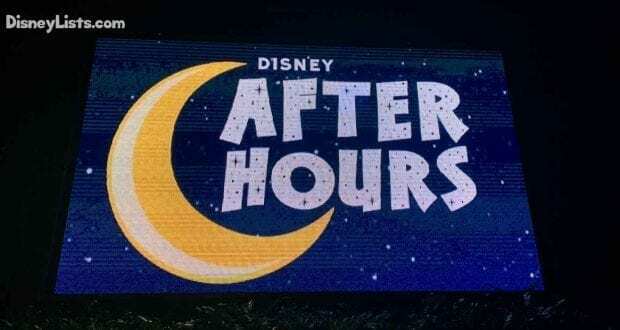 Click here for our full review of the Disney After Hours at Magic Kingdom. Click here for our full review of Disney After Hours at Animal Kingdom. Like other special events, your ticket allows you early entry to Hollywood Studios ahead of the event. For Disney After Dark, guests can enter the park at 7:00 pm even though Disney After Dark doesn’t start until 8:30 or 9:00 pm. We really recommend you do this. More time in the parks is always a good idea, but getting in early will allow you to experience attractions and entertainment that will not be available during Disney After Hours such as Fantasmic, Beauty and the Beast – Live on Stage, etc. These shows are excellent and well worth getting there early to enjoy. We think this is a pretty amazing list. Basically, it is almost all of the most popular attractions at Hollywood Studios! It includes a lot of characters and attractions, and offers something for everyone to enjoy! The Halloween Party includes candy, and the Christmas Party includes complimentary cookies and hot chocolate. Our favorite special event treats, however, are the treats you’ll get with your Disney After Hours ticket. 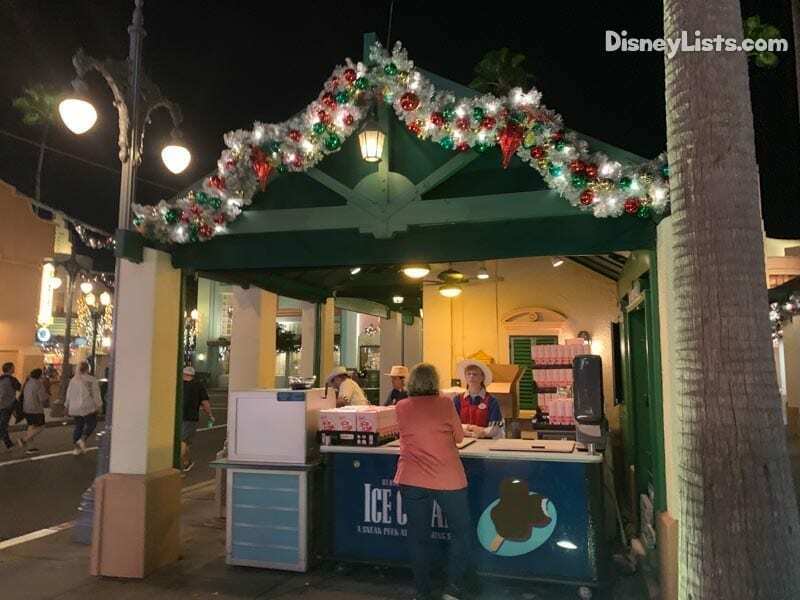 Included are unlimited select beverages (bottled or fountain Coke products), popcorn, and ice cream novelties from snack carts throughout the park. When we attended an earlier Magic Kingdom event, one of the few negatives was the fact that there were so few snack cart locations open. This meant that we had long lines for the food items—up to 10 minutes in some locations. When the wait for Seven Dwarfs Mine Train is 3 minutes, and the wait for food is 10 minutes—that’s not right! We’re happy to report that Disney listened to feedback and really stepped up here. We were surprised at how many places there were to grab a snack at Hollywood Studios. We counted seven different locations that were open throughout the night. We never waited more than one minute to get our treats. It really improved the overall experience of the event. The inclusion of unlimited drinks, popcorn, and ice cream definitely offsets the party ticket cost. Currently, the price of a bottle of soda is $4.50, popcorn is $5, and the ice cream treats are $5.75. We really took advantage of this benefit and came hungry. We each indulged in many ice cream treats and drinks, as well as eating our body weight in popcorn. Had we purchased these outright we would have paid around $35-$40 per person in snacks and drinks. Granted, if these items were not complimentary, we would not have had so much. The point though is that they are, and you can really take advantage of the included snacks. There is a special feeling of going up to the snack cart and not having to pay for it! Also, don’t be afraid to grab a few drinks and snacks for the road! We were able to leave with boxed popcorn and drinks in hand. 5 – How Empty Is It? When we recently enjoyed the Animal Kingdom After Hours event, the park was eerily empty. We don’t think that event was sold near to capacity. The Hollywood Studios event had more people, but the attendance cap was still in effect and worked great. The longest waits in the land were for the characters! Throughout the evening, the wait for Woody and Jessie was anywhere from 15-20 minutes. (Usually, the wait is anywhere from 30-45 min). Late in the night around 11:20 pm, I waited about eight minutes to meet them. Buzz had shorter waits around 10-15 minutes. By the end of the night, the wait for Buzz was only about two minutes. After the initial rush of guests to Slinky Dog Dash, waits in Toy Story Land were very manageable and very short compared to regular operating hours. Again, the only attraction that wasn’t a walk-on was Slinky Dog Dash, and that was just minutes. You’ll get all three rides in (multiple times) and get much shorter lines for characters than during regular operating hours. The attractions on Sunset Boulevard were walk-ons. Both Rock ‘n’ Roller Coaster and Hollywood Tower of Terror had the pre-show doors open, so you didn’t need to watch those if you didn’t want to. You could stop and enjoy the pre-show or walk straight through to the loading area. There were plenty of empty seats on both attractions. During December, you’ll also be able to enjoy Sunset Seasons Greetings featuring colorful projections on the Hollywood Tower Hotel. It was great to be able to do this during the event because the street was so empty compared to the packed street during regular hours. 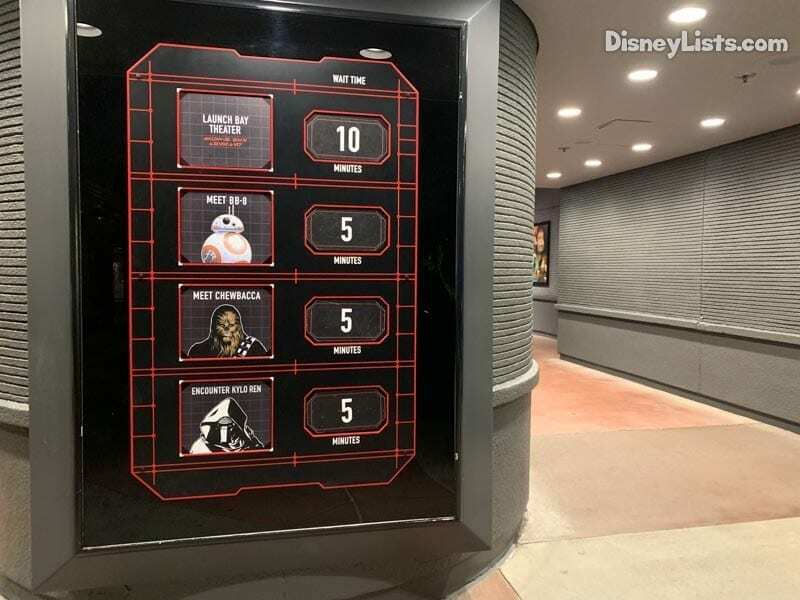 While we did not go into Star Wars Launch Bay, the posted wait times for the Chewbacca, BB-8, and Kylo Ren were all at five minutes, which means there was probably no wait at all. We continue to be very impressed with the Disney After Hours events. 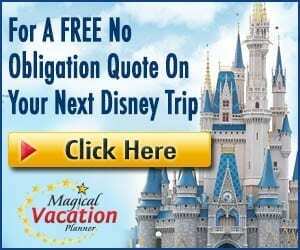 They are great options for guests looking to maximize their time ride time on Disney World’s most popular attractions. Not unlike the Halloween and Christmas Party, they are a great way to spend an evening. We really enjoyed the Hollywood Studios event, and considered it a great success. We rode all that we wanted to, left feeling full after enjoying plenty of snacks and drinks, and enjoyed meeting our favorite characters. This event is an excellent option for Toy Story Land fans and Sunset Boulevard thrill seekers. Guests and families who love the thrill rides, including Rock ‘n’ Roller Coaster and Tower of Terror, and want to ride over and over without standing in line will find this event a great way to get all of the favorites in. With the tiered FastPass system, riding all of these attractions with a FastPass just is not possible. By attending this event, you’ll free up valuable time to spend elsewhere. 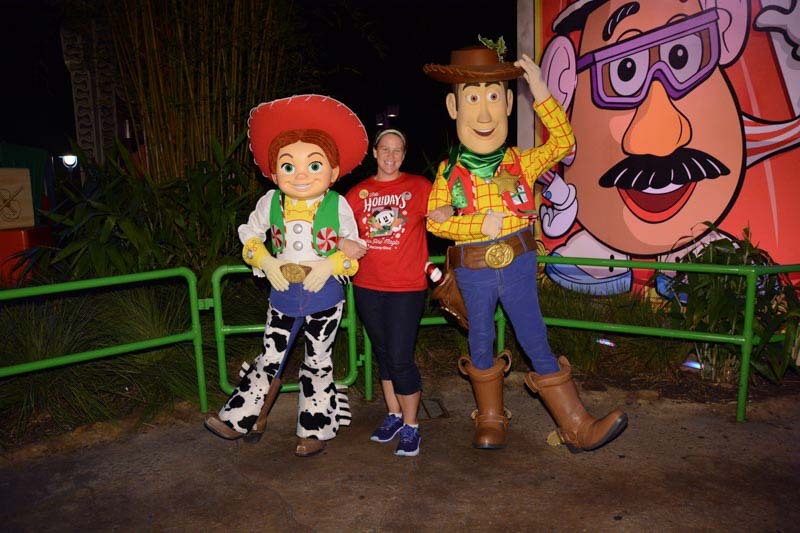 On the flip side, if you have children that aren’t tall enough, or don’t care for Tower of Terror or Rock ‘n’ Roller Coaster, but you want to take advantage of an empty Toy Story Land, then we recommend Disney Early Morning Magic at Toy Story Land. This event includes breakfast and one hour and 15 minutes in Toy Story Land. You’ll still get the empty land and the ability to ride each attraction multiple times. Click here to read our review of this event. This ticket costs less at $79 per adult, but one big difference with this event is that separate Hollywood Studios admission is required. However, if you were planning a day there anyway, it may make more sense for you. Only your family can make that decision, and we want you to be aware of all of the options. Editor’s Note: The Disney Company provided us with complimentary Disney After Hours passes. However, the thoughts and opinions contained in this article are completely our own.